Bus and taxi services serve as the primary means of public transportation in Macao. As a traveller, you will find it convenient and inexpensive to ride a bus around the territory, with local buses both modern and air-conditioned. Taxis are also regarded a convenient option in this relatively small city. If you want to try something a little different, hire a tricycle, bicycle or car to see the sights. The taxi in Macao is in black with a cream roof. The flag-fall charge is MOP19.00 for the first 1600 metres, with MOP2.00 added for every 240 metres thereafter. MOP2.00 is charged for waiting per minute at the passenger’s request. There is a MOP3.00 surcharge for each item of luggage carried in the boot. For radio taxi service, please call +853 8500 0000 / +853 2828 3283. There is a MOP5.00 surcharge for boarding a taxi at Macau International Airport, the taxi station of Taipa Ferry Terminal, the campus of the University of Macau, the Hong Kong-Zhuhai-Macao Bridge Frontier Post at Macao Port or journeys from Macao to Coloane. From Taipa to Coloane, a MOP2.00 surcharge applies, while there is no surcharge from Macao to Taipa or from the islands to Macao. In addition, there is also a special radio taxi service, which the vehicle is blue in colour. 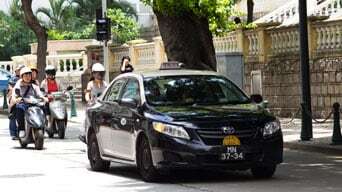 Like normal taxi, the fare of the special radio taxi is charged according to the taximeter, but with an additional hailing fee of MOP5.00 (this fee will be waived if the booking is made more than one hour in advance). 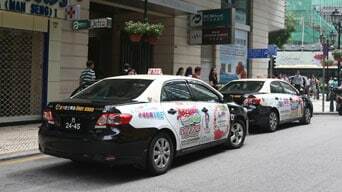 For special radio taxi service, please call: +853 288 12345, visit http://macaotaxi.com/en/ or download mobile app "Macao Taxi". For more information, please contact Macau Radio Taxi Services Limited at +853 8893 9999.